My mother in law made this a few weeks ago and then brought some for our Christmas appetizer snacks. This is a great warm dip with pretzels or any type of crackers. And it freezes very well. Just know, she didn’t want me to post the picture, because we left it in the oven a little long and the bacon is a little browner than we would have liked for a picture! Mix mayo, cream cheese, cheese and onions into a greased 8×8 pan. Top with the crackers and bake for 15 minutes on 350 degrees. Top with bacon and pepper jelly, then serve with crackers. This is the recipe that comes with Captain Rodney’s Pepper Glaze. It’s sooooo good with that Glaze in the place of the pepper jelly! 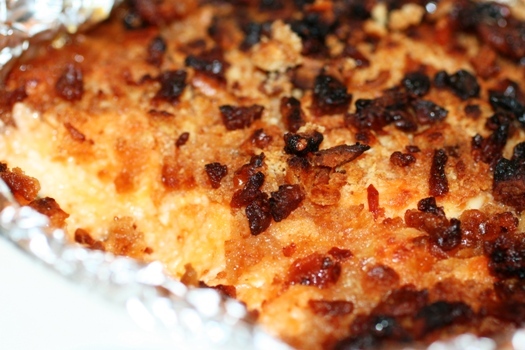 I think it looks AWEsome with the “crispy” bacon…I’m gonna have to try this one out (maybe tomorrow for “Football Day”!! Mayo & Cream Cheese? Count me in! lol. I can’t wait to try this. Is captain Rodney’s boucan glaze gluten free? That’s the funniest thing I seen on the interwebs this year.